Did Club Nationals even really happen last year? Does it really count if #2 San Francisco Fury and #3 Seattle Riot don’t play each other? It feels like the two square off every season, and that’s because they virtually have. Since 2006, the two clubs have faced each other in the bracket at Nationals in nine out of 12 seasons, with all of those games coming in semifinals or the final. This year makes it 10 out of 13. It’s the defining rivalry of the division over the last decade and a half. Famously, Fury has owned the rivalry over most of its lifetime. But Riot has won the last two times the pair have faced each other at Nationals — in semis in 2015 and 2016 — and hold a 10-4 head to head advantage since 2015 as well. 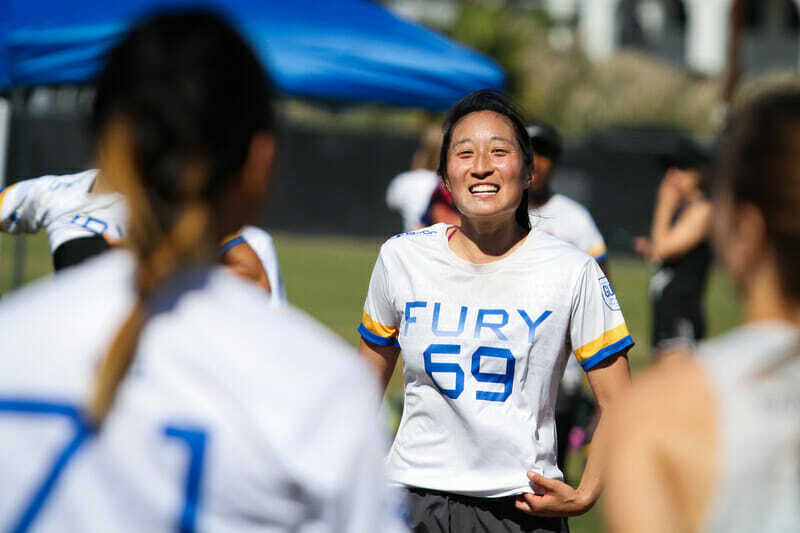 Fury and Riot both have won major titles since then: a club national championship for Fury a year ago, and a WUCC title for Riot earlier this year. They’re two top teams, ultimate royalty as clubs, and the history between the two has been laid out again and again. But this year, there is a little something extra, a particularly precious jewel in the crown of ultimate’s royal rivalry: Sarah Griffith will be playing against her old team with a spot in the national final on the line. The former 10-year veteran of Riot, and back to back All-Club First Team selection, will square off with her former teammates in the most important game of the season to this point. It doesn’t get much more dramatic than that. Griffith left Riot amicably as a world champion. She moved to San Francisco, which made remaining with her Seattle teammates impractical. She still has life long friends on Riot and, to an extent, probably still feels like she’s part of the team. It would be impossible to try to guess how Griffith will be feeling in the moments leading up to the game, but she’s the type of player who will try to play it like any other. But the added emotional weight for the conclusion of the game, whether it be for Griffith or her former teammates, is an extra layer of meaning to a matchup that is already overflowing with it. Beyond Griffith, the game will of course feature superstars and future Hall of Fame inductees1 on the field and on the sideline as coaches. Fury and Riot have been as good as they have been for so long because they always have incredibly talented players and smart minds leading the way. This season is certainly no exception. At every matchup on the field, there will be two world class players going toe to toe. So what will be the difference be between the two? What will cause the separation between moving on to Sunday’s final and having the tournament come to an end? Both teams know each other so well and have played in these high pressure situations so many times. Both teams have played similar amounts of points this weekend, with Fury playing 87 and Riot playing 92, so neither team really has more tread on the tires. The biggest factor in determining winner and loser could be the battle of the backfields. Riot and Fury have the two deepest handler units in the division and the group the outplays the other will likely lead their team to victory. Perhaps that feels like an obvious thing to say, but with so much athleticism downfield on either side, both teams’ cutting units are likely going to get their fair share of big plays. As a result, the handler group that has the fewest turnovers offensively and applies the most pressure to their opponents defensively will likely be the one heading to the final. It will be an interesting contrast in styles, too: Fury and their inside break forehands versus Riot and their around backhands. The side that can better force their opponents into getting away from their ideal game will seize the advantage in the most crucial part of the field. It’s now time for another chapter in the Fury-Riot epic. Expect jaw dropping plays and swings of momentum back and forth. There’s no better show in the sport than when these two line up across from one another. No two teams have combined for more classics in the sport. Maybe that simply comes with having played so many times in the biggest, most important games. But there does seem to be a little intangible magic between the two. So many times they’ve played the game that has defined a Nationals tournament. With them set to play in semis this year — and in the final game of the night, no less — ultimate fans will be able to get the complete Nationals experience in 2018 that they missed last year. Comments on "Playing the Classics: Fury and Riot To Do Battle at Nationals Yet Again"